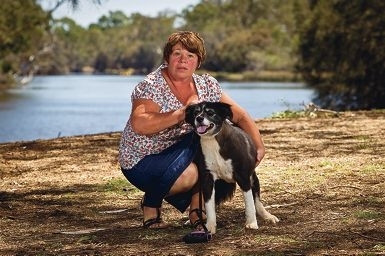 One particularly vicious attack on a four-year-old collie near the Swan River in Woodbridge left the dog owner traumatised and with expensive veterinary bills. The dog is nursing its wounds two weeks later and is too scared to leave the house. Guildford resident Sue, who asked for her surname not to be published, said she was upset her dog Millie was allegedly attacked and viciously mauled by a Shar-Pei. Shar-Peis ” described by dog experts as territorial, dominant animals suitable for experienced handlers ” are an ancient breed originating in China. They often protect farms and property and are believed to have been used in dog fights. Sue said the alleged attack came when she was walking with Millie near Ray Marshall Park, on the corner of Great Northern Highway and First Avenue, Woodbridge. Her dog required stitches for multiple wounds and was treated by a local vet. ‘I just want to warn people who walk their dogs there that this happened, so they can be on their guard if they go down to that area,’ she said. City of Swan chief Mike Foley said the council had conducted an investigation into the alleged attack and ‘no further action’ could be taken because neither the dog nor its owner could be identified. ‘If either were discovered in the next 12 months, the investigation could be reopened, he said. Owners can be fined up to $10,000 in court for being liable for the control of a dog that attacked another animal. Other attacks have taken place in Cockman Cross, Stratton, in which a white dog was killed and another mauled after a staffordshire allegedly tried to kill both of them in a street attack on February 10. A Stratton resident said the attacker pulled the female owner of the white dog to the ground and fractured her arm. She was extremely shaken and hospitalised following the attack. About a dozen neighbours gathered on the street and captured the dog that allegedly committed the attack. It was later impounded by City rangers. Mr Foley confirmed a dog had been seized pending the outcome of an investigation. He said no decision had yet been made regarding any possible charges against the owner.